Confederate statues: What do they stand for? Behold, the newest batt leground in our interminable culture wars, said Kyle Smith in NationalReview.com—Confederate monuments. In the wake of the violent protests in Charlottesville, Va., over the planned removal of a Robert E. Lee statue, leftists are baying for the destruction of all 700 or so Confederate memorials dotted across the country. Officials in Baltimore and Austin have already removed several statues under the cover of darkness. Towns and cities in such states as Kentucky, Wisconsin, and Florida have agreed to do the same. 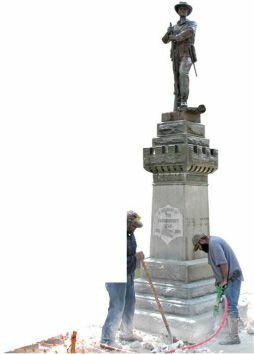 In Durham, N.C., an out-of-control “mob” tore down a monument to a Confederate soldier with “orgiastic glee.” Personally, “I have no fondness whatsoever” for Lee, Stonewall Jackson, or any other rebel icons. But where will this “war on symbols” end? As President Trump rightly noted last week, Thomas Jefferson and George Washington were slave owners—are statues of the Founding Fathers next to be torn down and erased from history? That’s a pinched and distorted way of looking at it, said Arthur Herman in NationalReview.com. To many Southerners today, these monuments commemorate the “honor, valor, and sacrifice” of soldiers who fought for their region. Let’s not forget President Abraham Lincoln’s determination after the war to avoid “retribution” and heal the wounds of the nation through “reconciliation.” That this country can “honor the heroes of both sides” of such a devastating conflict is a shining example of American exceptionalism. When we tear down statues erected by previous generations, said Peggy Noonan in The Wall Street Journal, we’re “toppling more than brass and marble.” We’re tearing down our nation itself—“all the things, good, bad, and inadequate, that made it.” Why try to hide from our imperfect past?